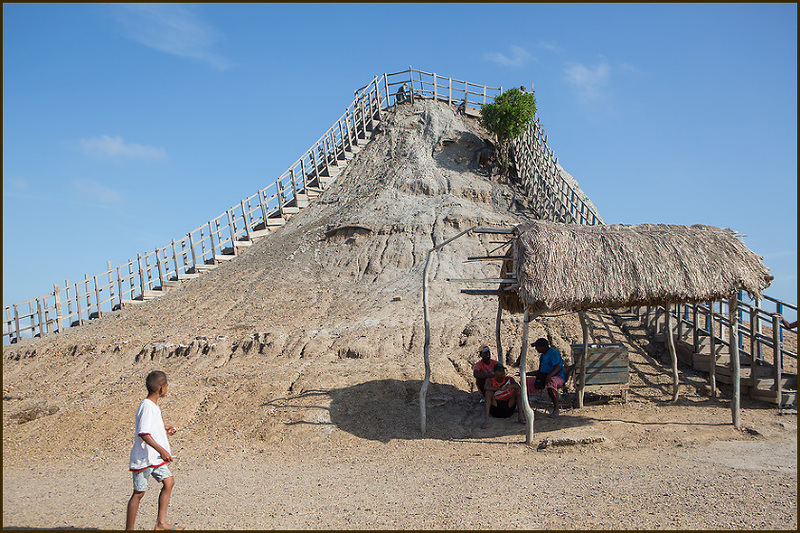 One of the absolute highlights of our trip to Colombia was a stop at the mud Volcano, El Totumo. It was our last stop before leaving the country, and definitely the kids’ favorite memory! We had a driver for the 4+ hours from Santa Marta to Cartagena and we asked him to stop there on the way. It’s not far out of Cartagena. We pulled into a dusty parking lot and our driver parked while we made our way towards the hill. Two guides immediately joined us, and offered to hold our things and take photos for us. They were very friendly and helped us navigate the small crowd at the top and descend into the mud pit. Once in, we had a blast! The mud was thick and sticky and warm, like a bath. Our feet didn’t touch the bottom; we were buoyant enough to just sort of float on the surface. There was a very insistent gentleman who kept sneaking up and trying to give us massages, even after we tried to politely convey that we weren’t interested. Maybe that would have been a time to be less polite and more forceful, but overall he was harmless. When the wind hit us after we got out it was a bit chilly. Once we got to the bottom again the wind subsided and the sun warmed us. Then it was time to walk down to the river to get rinsed off. There are some local ladies who do the job for you for a small tip. I had read ahead of time that they were very thorough, and that turned out to be the truth! 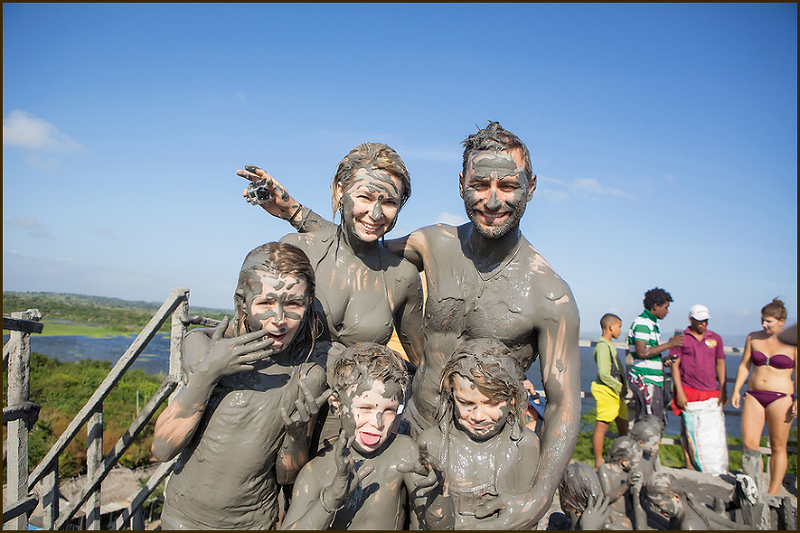 They were very business-like and no part of me was missed…I was certainly mud-free when they were finished. We paid the typical tips to the ladies and the two friendly guides who had taken photos for us and walked back towards the car to change into dry clothes. Standing there waiting a bit creepily by the car was the massage guy from up top, clearly expecting a tip for his “services”. He must have been following us. We tossed him a tip and jumped in the car. Back to Cartagena for one night’s sleep before our flight out to Panama early in the morning. Our trip to Guatemala involved us flying in to Flores, a tiny town in the north part of the country that is a gateway to the ruins at Tikal, and flying out of Guatemala City. After Tikal we were heading to the south part of the country and had to figure out how to get there. We finally decided on the overnight bus. The company we chose was Linea (one of two primary bus lines) and the bus was to leave the station around 8 pm, so we had some time to kill in Flores after checking out of our lodging in Tikal. Flores is a beautiful little town that sits on an island in the middle of a lake. There is not a lot to do there, but we had heard that a boat ride around the lake was a pleasant way to spend a few hours. When we tried to book it at our hotel the price they quoted was 1200 quetzales ($163 USD). Fortunately we decided to wait until we got there and the price in person was significantly less…200 quetzales ($27 USD)! After some truly fantastic tacos, we hopped on a small boat and our guide took us around the peaceful lake and stopped at a few places. 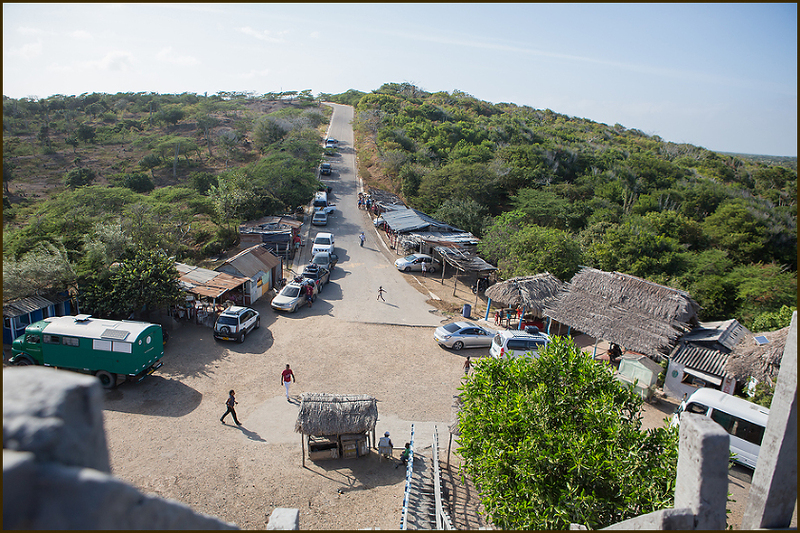 The first was a trailhead that lead up to a lookout point where we could see the whole town of Flores on its tiny island. Next we spent some time at the dilapidated zoo. It’s not a place I would recommend…some of the animals are kept in very small, run down enclosures. There were peccaries running free, and spanish speaking macaws. As the sun began to set, it was time to head to the bus station. The bus was late, but everyone was friendly and we felt safe there as night fell. We boarded the bus and tried to get comfortable in the worn seats. It was a long night. Through the 8 hours, there were many stops with people getting on and off. Limbs constantly fell asleep from the contorted positions we had to take. Of course I woke up frequently to do the 1-2-3 kid count and make sure everyone was ok. It was a dark, bumpy, and uncomfortable ride. Getting off in Guatemala City was a relief, and we hunted for caffeine in the bus station. Crime is more of an issue in Guatemala City than the other parts of the country we visited, so we stayed in the indoor station protected behind security gates as we waited for our ride to Antigua. Josebal (JB) picked us up in a van and navigated us through the large city. He was amazing, telling us all about the history and politics of his country, as well as his personal story. Apparently there were going to be massive protests against government corruption that day, so we made it out of the city just in time! Since it wasn’t quite time to check into our rental house, he took us to a restaurant perched on the hills overlooking Antigua, and 2 of Guatemala’s most famous volcanoes– Acetenango and Fuego. Fuego is very active, so we had a delicious breakfast on a terrace watching in awe as billows of smoke and ash poured in intervals from Fuego’s peek. After breakfast, we walked around admiring the art on display and the kids got a playground break. We only spent a few days in Antigua, but it is a lovely town. It has an interesting history and colorful buildings. Crumbling old buildings and pristinely built churches frame the streets filled with motorbikes and chicken buses. Volcanoes tower overhead. Relatively safe, it is popular with backpackers. There are lots of hostels and funky fusion restaurants. We met more fellow travelers from around the world on the days we explored the town than any other part of our trip. Our favorite moments were relaxing on the roof of our rental house with a bottle of wine, watching heat lighting break through pink sunset clouds over the ever present dramatic volcano silhouettes. I don’t know if we’ll be living in California for 1 more year, or maybe 3, but I do know our time is limited and we want to see as much of this part of the country as we can while we’re here. The La Brea Tar Pits and Museum are a fascinating stop right in the city of Los Angeles. A slice of ancient history surrounded by miles concrete and sprawl. Arriving through the gate, we saw a fenced off black bubbling tar pit with a life sized wooly mammoth family in sculpture. The tar pits are actually extremely sticky natural asphalt, and during the ice age large mammals would get caught in them while roaming the plains. Their cries as they tried to free themselves would attract predators, who would then also get stuck. The result is a pile of a multitude of well preserved bones from several species just waiting for archaeologists to discover. There was quite a long line to get into the museum, but fortunately it was a pleasant day and the kids climbed trees and rolled down the grassy hills while we waited. Museum employees walked up and down the line showing off saber tooth tiger skulls and a local banjo player provided background tunes. It’s actually an ongoing excavation site and they are uncovering hoards of ice age creatures. Many of the skeletons have been re assembled and are featured in the museum. Wooly mammoths, saber tooth tigers, and giant sloths are just a few of the amazing species on display. They had educators scattered throughout answering questions, and a fun live show illustrating the history of the tar pits and featuring an animatronic saber tooth tiger. We really enjoyed this little slice of history in the middle of the city. I had seen the lovely photos of the Greek island of Santorini in travel magazines, but nothing prepared me for how it felt the first time I stepped out on the edge of the caldera in Firostefani. My eyes actually filled with tears as I was struck with the vastness and beauty of the open space dropping out before me. The cliff is so steep, and the bowl of the caldera so immense. The inky blue Mediterranean was dotted with tiny white cruise ships and large seabirds lazily circled on the air currents way below us. The smooth walkways and cave dwellings, mostly all in white, were otherworldly. We were there for a week to see two of our good friends get married, and we went in with two other couples to rent the Blue Angel cave house in Firostefani. Elaborate rounded rooms with over the top decor and a rooftop soaking tub with an amazing view greeted us as we rounded the corner to our temporary home. We had selected Firostefani to stay in because it is known to be one of the livelier towns in Santorini, with lots of restaurants and bars and things to do. After a couple of days of settling in and relaxing, our friends organized a day-long sailboat charter in the vicinity of the island. We made several stops, including an island made of lava rock and a cove that was great for swimming. It was very neat to see the cliffs of Santorini from down below! The next day, Jason and I were on our own, so we walked up the main road near our cave house, and stopped at the first vehicle rental place we found. Soon we were on a four-wheeler zipping down the road towards Oia for the day. Oia is on the other end of the island from Firostefani, and has a very different feel to it. It’s much quieter, and more polished and immaculate. When we first arrived, we encountered hoards of people filing down the streets and into shops and alleys. We soon learned that it was “cruise ship day” and all of these folks were taking advantage of the limited shore time they had before it was time for them to re-board their ships. After an hour or two, the crowds dissipated and we were able to enjoy exploring the peaceful city with it’s fascinating architecture, iconic white and blue churches, and fantastic restaurants hiding in rounded nooks. Next came our friends’ wedding. I can’t imagine many settings more romantic than a balcony overlooking the sweeping views of Santorini just before sunset. It was wonderful and there were many tears:) I was photographing the wedding and crying behind my camera! Here are a few images…there are more on my photography blog. After the wedding we had one more day and we weren’t ready to leave. Toasting the last sunset, we tried to soak it all in and promised each other we would be back one day. Svet Dimitrov - Can you believe I am a Bulgarian, almost 30, and I still have not been to Greece. I shall get busy booking!